This guide was adapted from Managing Copyrights & Negotiating Agreements by UC Berkeley Library Scholarly Communications Services, which is available under a Creative Commons Attribution-Noncommercial 4.0 License. Once you’ve written an article or a book, you will generally have to sign an agreement with a publisher before it gets published. The terms of these agreements vary widely, and control how you can use your own work later (including on your own websites, or in your own scholarship or classrooms). So, it’s in your best interests as an author to read them carefully and try to negotiate changes when necessary. Are you working on a publishing agreement you haven’t signed yet? If so, move on to the next section. Are you wondering what you can do under the terms of an agreement you’ve already signed? We have a section for you too – see “If you’ve already assigned your copyright, can you get it back,” below. Publishing agreements are an exchange. Typically, journals’ publishing agreements will ask that you transfer or license your copyrights without financial compensation. In return, your work is published, receiving the visibility, prestige, and credibility associated with the journal. The publisher gains the ability to control how your work is published and can set terms and conditions for others to access the work (e.g. subscription prices, online access). In the case of scholarly books, the publishing agreement transfer or license will typically involve a monetary transaction: You receive a lump sum or royalties based on how many books are sold, and the publisher receives rights to control the price of the books (if they’re not open access), the manner and terms of how the book is published, whether new editions or translations are created, etc. 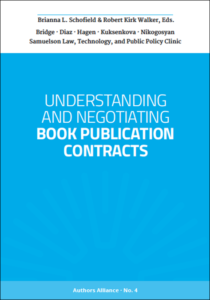 For a detailed guide to negotiating book contracts, see the Authors Alliance’s guide to Understanding and Negotiating Book Publication Contracts, available for free on the Authors Alliance website. They may ask you to transfer all of the exclusive rights you hold, or might not ask for a transfer at all, but instead merely a license to certain of your rights. To determine whether you’re comfortable with the terms of the transfer or license, it is helpful to start by thinking about your goals for the work. You wish to commission a translation, but your publisher is now the only one who can authorize the publication of one. Depending on how similar your later works are to the work covered by the agreement, these might count as “derivative works”— and the right to create them may have been assigned to your publisher. A quick note about the UC open access policies: As of October 23, 2015, scholarly articles (not books) written by any UC faculty member or other employee are covered by an open access policy unless the author obtains a waiver. Under these policies, authors grant a non-exclusive copyright license to the University for deposit in eScholarship prior to any later agreements authors may make with publishers. UC retains those rights regardless of what rights authors may subsequently transfer to publishers. The UC OA policies are intended to preempt or augment publishers’ default terms, granting UC – and by extension you – rights to share your article beyond what is allowed in a standard publishing agreement. Read more in the UC OA Policies FAQ. Once you figure out what future uses you do or might want to make from your work, you can explore what options you have to preserve necessary rights. It may not always be possible to successfully negotiate changes to your publisher’s agreement. You will likely find publishers more willing to negotiate about book contracts than journal contracts; you may find commercial or large publishers more willing to alter terms than nonprofit or smaller publishers, but you won’t know for sure until you try. Sometimes, you can get rights back even if you’ve assigned them away. Some book publishing agreements include contractual provisions that permit authors to work with their publishers to regain some or all of the rights in their books when certain conditions are met, such as sales drop below a certain number. 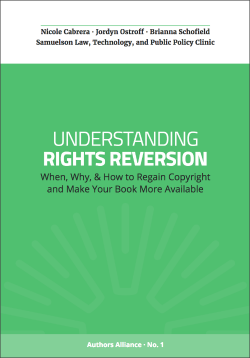 The Authors Alliance has a detailed guide explaining what to look for and how to work with publishers if your contract has one of these provisions, Understanding Rights Reversion: When, Why, & How to Regain Copyright and Make Your Book More Available. The guide is available as a free download from their website, or you can order a print copy. Even if your publishing agreement doesn’t expressly have a reversion clause, you could try negotiating for rights reversion with your publisher anyway—particularly where your work is a book that is out-of-print or circulation. Publishers might be willing to assign rights back to you if they have no future commercial plans for your work. If you are interested in regaining copyright ownership in, or getting greater rights to use, a journal article for which you signed a publishing agreement years ago, you’ll likely have a harder time. Subscriptions to older journal content is often still a source of revenue for publishers, and journal publishers may see no incentive to negotiate with you about rights for a single article in their vast collection. For a great guide on how to later negotiate a reversion of rights, even if the publishing agreement you signed didn’t contain one, check out Chapter VI of Authors Alliance’s guide Understanding Rights Reversion (pp. 70-100). You can also try Columbia Law School’s Keep Your Copyrights Guide—in particular, the section on Getting Your Rights Back. If a termination right might exist, the tool estimates – based on the information you provide – when the termination right might be exercised. The tool gathers this information along with some basic details about the work that might be useful and relevant to preparing the “termination notice” required to officially start the termination process. We can’t give you legal advice, but we can help you understand issues and find more resources. Please contact us at osc@ucop.edu.